Skip this section at your peril. Spending an extra half hour here can save you hours of painstaking cleanup or worse still the cost of replacing carpet or other items that you apply permanent glow in the dark features to. Firstly remove all the large objects from the room that you cannot safely work around. You’ll need to be able to move a ladder within 2 ft from the walls to safely paint the ceiling near the walls. When painting a bedroom removing the bed will really help you. Otherwise you’ll have to stand on the bed to paint above it, which will require you to cover the bed and to be tall enough to comfortably reach the ceiling. Remove small items of furniture that will prevent me from getting within two feet of the wall and hinder movement of the ladder. Put the floor covers down. Attach UV lamp to the top of the ladder. Tape UV power cord to ladder frame to prevent getting it caught up while moving around. 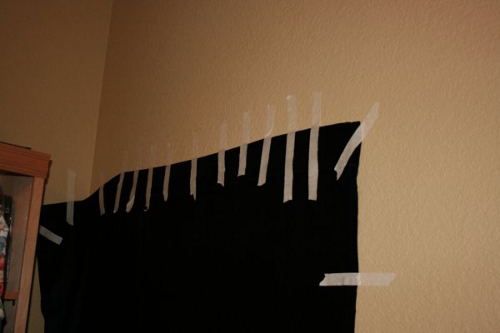 Put the window coverings on and tape them to the walls to cut out as much light as possible. Roll out enough power cord, to enable the ladder to move around without causing a trip hazard, and attach to the UV light. Make sure that you push the cover right up to the wall. If you don’t then the cover will pull away if you stand too close or move the ladder too close. Next you need to cover the windows to block out as much light as possible. If the room has a curtain rail then this is much easier. 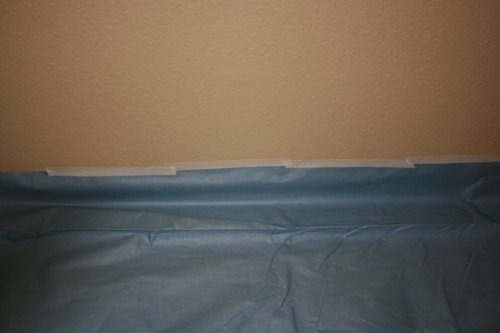 If not you can still stick up a heavy drape using plenty of tape, as I have in the above image. 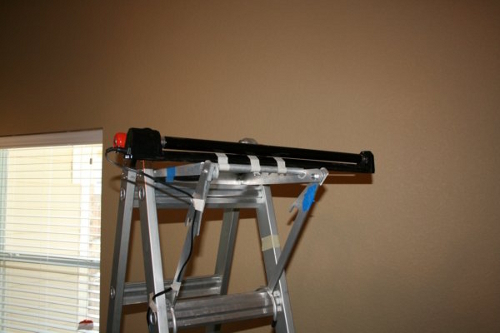 Tape the black light to the ladder and ensure that the flex is taped to the sides to prevent snagging or tripping when working in the dark.